A Swiss education really does open doors to the world’s best universities. Here’s a rundown of where this year’s graduates are headed, with links to previous articles and testimonials from our worldwide family of alumni. 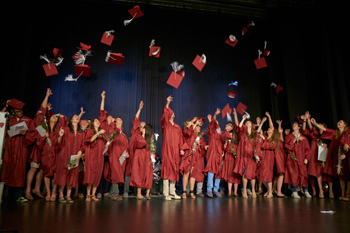 July was a time of great celebration – and a few tears – as we said good bye to a class of graduating students, thus completing many fulfilling years attaining a Swiss education, with a distinct international aspect, here at Brillantmont. Of course not all our alumni stay in Switzerland or head to the UK. Northeastern University was perhaps our best-attended US university from our most recent graduating year. We also have former Brillantmont students at New York University (NYU), Boston University and the American University, Washington. Not to feel left out, universities in France, Japan, Brazil, Spain, Italy, Portugal and Korea, all welcomed Brillantmont graduates. Now that you’ve read about just some of the excellent universities our students were able to attend thanks to their time at a Swiss international school, why not learn more about the country, why it is so great for developing young minds, and what’s on offer here at Brillantmont? Speak to us about schooling in Switzerland? Feel free to contact us or book a tour of the campus when you are next in Lausanne, Switerland.